Pete Lee's comedy is candy coated with a dash of mean. Pete mixes cutting punchlines with an underdog perspective to absolutely roast himself on stage. His likable style and self-deprecating humor have made him one of the hottest acts today. He made his television debut on Comedy Central’s Premium Blend. Since then, he has been a standout at the Montreal Just For Laughs Comedy Festival. His comedy CD Gasmoney plays in regular rotation on XM and Sirius Satellite Radio. He is a regular on the Bob and Tom radio show. Recently, he was selected as a semi-finalist on NBC’s Last Comic Standing, filmed his own Comedy Central Presents special and played a doctor on CBS' As the World Turns. His growing popularity placed him 7th out of the top 100 comedians in Comedy Central's Standup Showdown. Pete also proved that his humor transcends demographic boundaries by winning Country Music Television's Next Big Comic. In addition to standup, Pete also loves writing, directing and editing web shows. A few years back, Pete created a web show called Unsportsmanlike Conduct, which attracted the attention of the NFL. This earned Pete a role in the NFL Network pilot titled After Further Review. 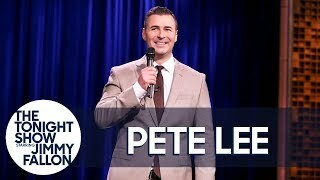 Most recently, he created Pete Lee's Internet Freak Show, which earned him a spot as a cast member on the FUSE TV's new show, Special Videos Unit: Video on Trial. Pete can be seen weekly on the web and TV, as well as touring the country.